If you’ve ever stayed at a Caribbean resort where everything you wanted is at your fingertips, then you know what Shores of Panama is all about. Guests here enjoy all the amenities of a beachfront resort, with easy access to the best Panama City has to offer. Soaring 23 stories over one of America’s most highly rated beaches, the Shores of Panama Resort features a world-class pool, complete spa services, a kids club, a health center with a steam room, covered parking, and 2 tiki bars. Enjoy striking contemporary architecture and lush landscaping. Stroll along the sugary white sands of a world-class beach. Play in the sparkling green water. The Shores of Panama is close to an exciting collection of restaurants. Head off to explore one of the Gulf Coast’s classic beach towns. Families can spend a day at Shipwreck Island Water Park, or the Gulf World Marine Park. Take an eco tour into the nearby wilderness of Camp Helen and St. Andrews State Park. Panama City is rated as one of America’s top three golf towns by Golf Digest magazine, and features five championship courses. 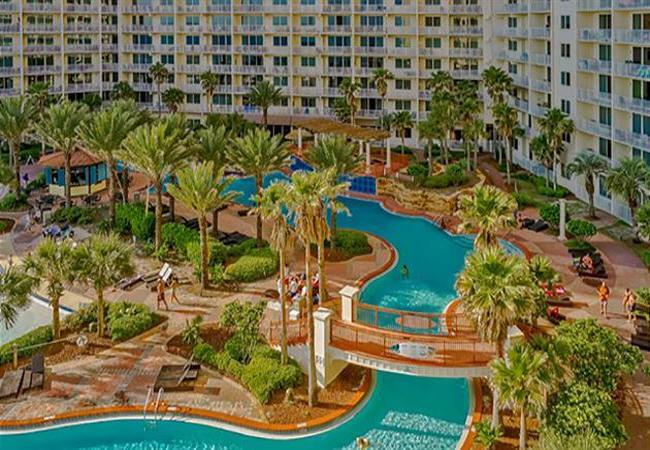 Discover the perfect Panama City Beach vacation at the Shores of Panama Resort.